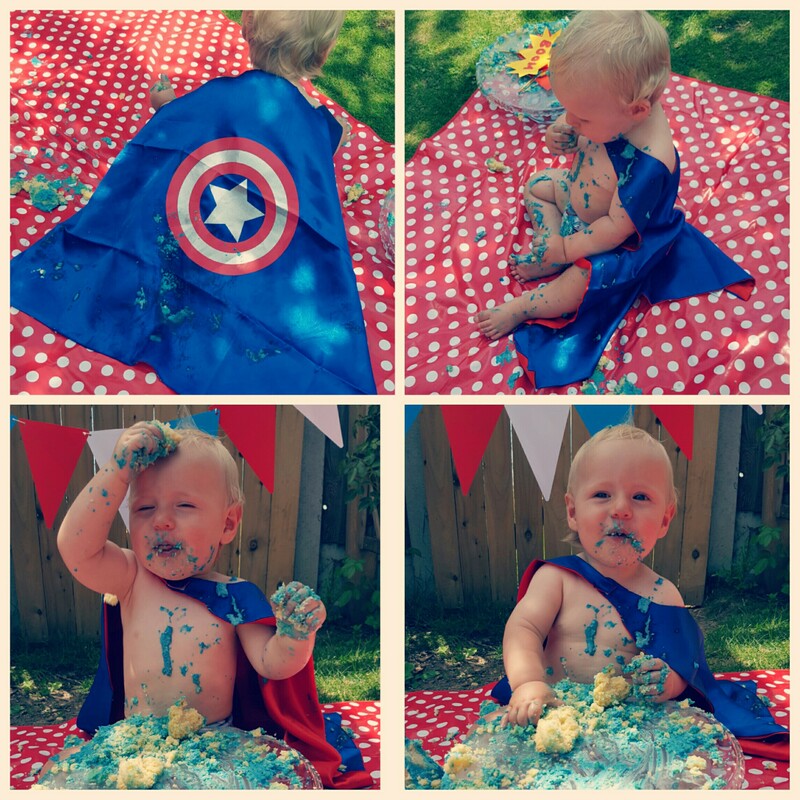 I’m sure you’ve all seen the new craze of doing a cake smash for a baby’s first birthday. It seems to be an American tradition that has migrated over to the UK, along with the likes of proms, bridal showers and baby showers. 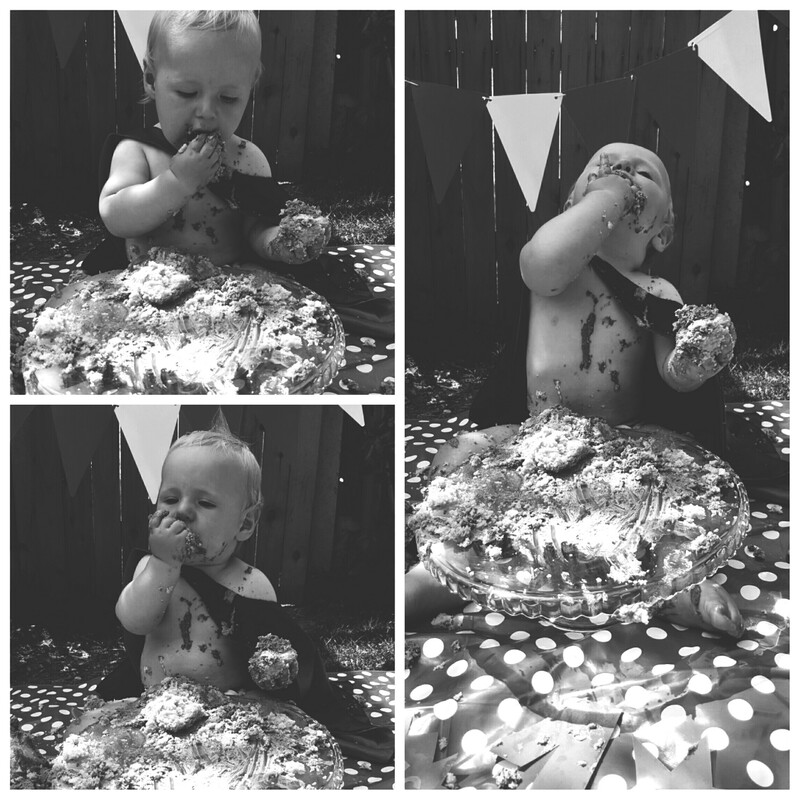 Some people may think it’s a step too far, but personally I just think it’s a bit of fun, and what one year old wouldn’t want to put his face in a cake! There are lots of fabulous photographers around who do some great packages. However, after doing a lot of research and speaking to many friends who had done similar shoots, I decided that it was a lot of money to spend when I didn’t know how Alfie would react. I didn’t want to spend all this money and he hated it and I didn’t get any decent photos (I’m still upset about our disastrous newborn shoot!). So I decided I would do it myself. I’m no photographer, and would never normally attempt a photo shoot, but as it was just a bit of fun, I didn’t mind too much if it went wrong! 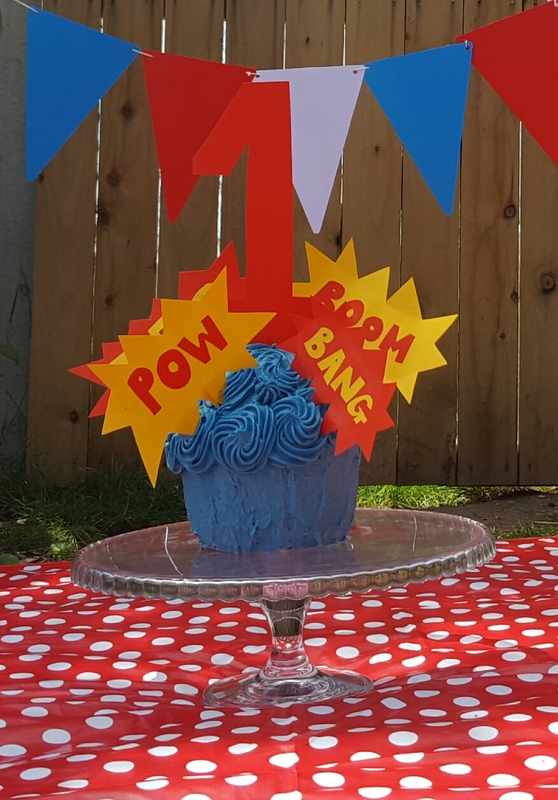 I decided to go for a superhero theme as my husband is obsessed! 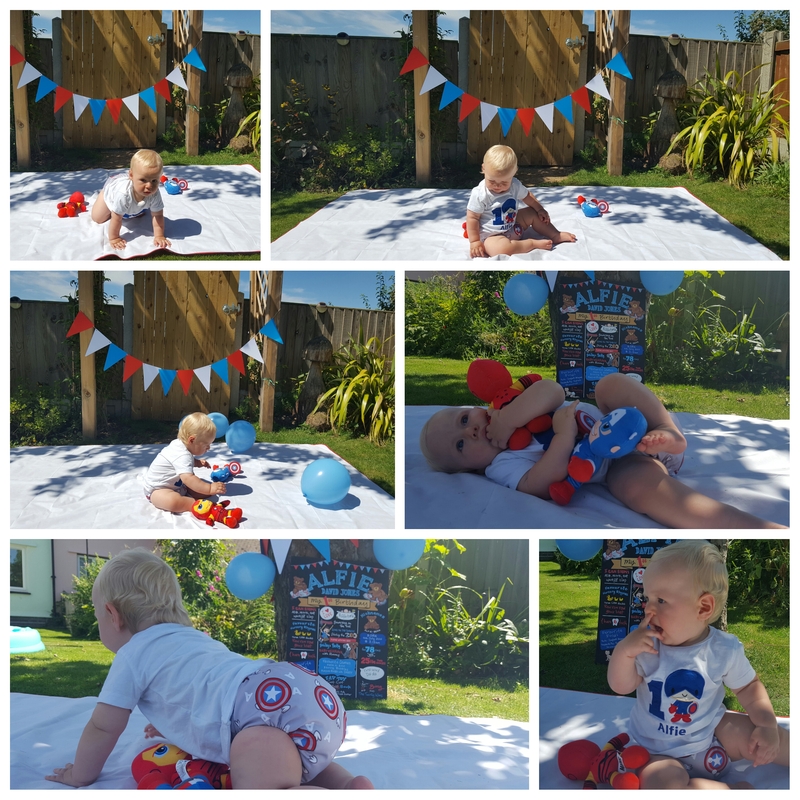 I bought a Captain America Cape, nappy and tshirt and made a board with a Marvel backdrop (which was only used briefly in the end). 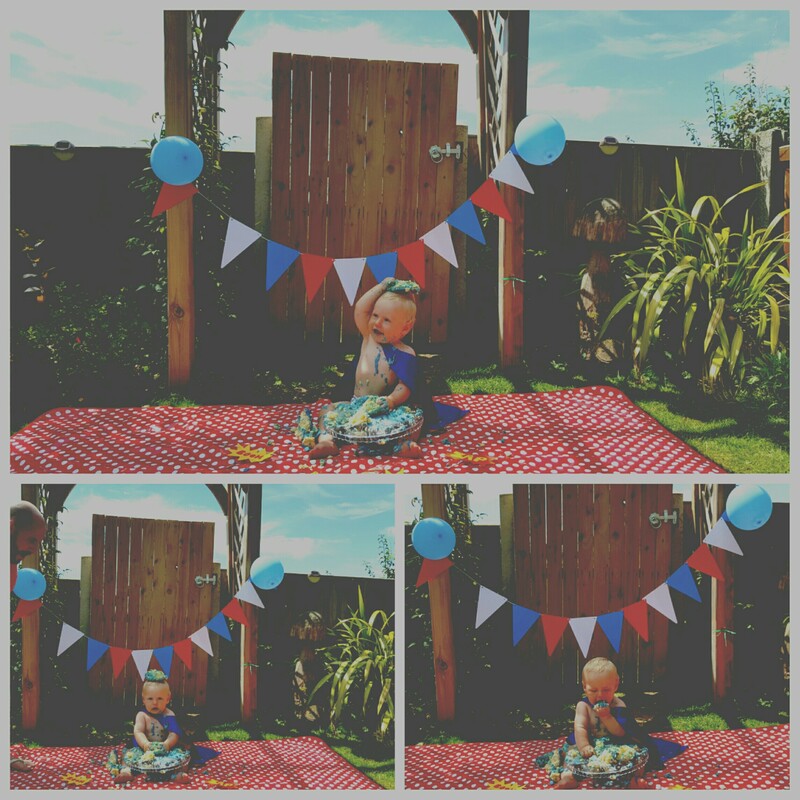 I also had some blue balloons and red, white and blue bunting, plus a Captain America and Iron man teddy for Alfie to hold. I put Alfie’s birthday board in the background as well. I also made the cake myself. 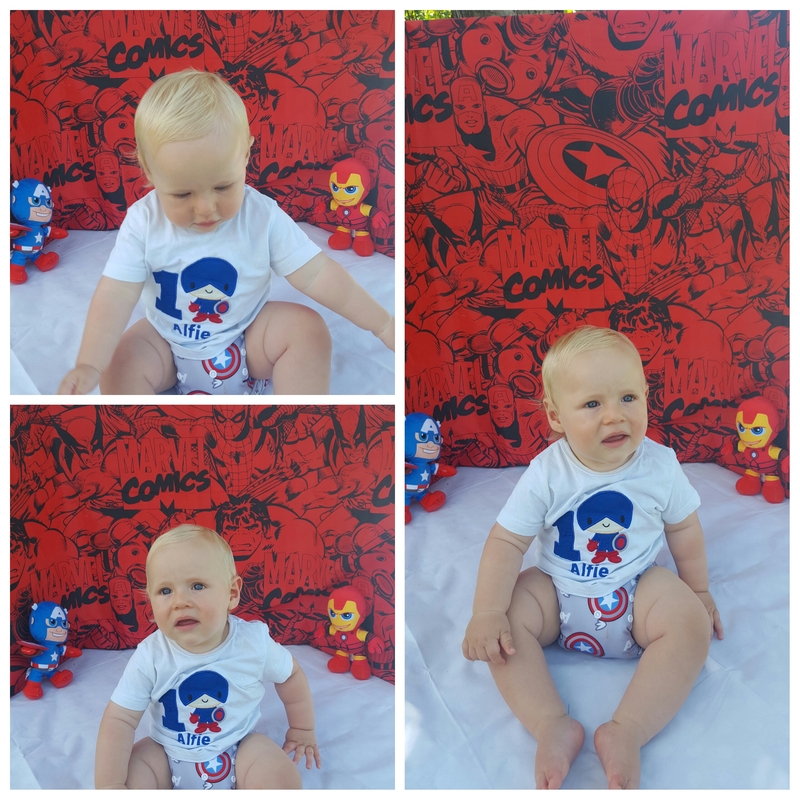 I wanted to get some nice photos of Alfie in his superhero tshirt but he was so grumpy and really wasn’t playing ball! I got stressed, Craig got stressed, Alfie got upset, the dogs went mad and my sister just laughed at us all!!! It was rather hectic and the more we tried to force it, the worse it was. We decided to take a break for lunch and try again once we’d all had something to eat. Of course Alfie perked up once the food came out! So once he’d been fed and watered, we thought this was the perfect time to bring the cake out. 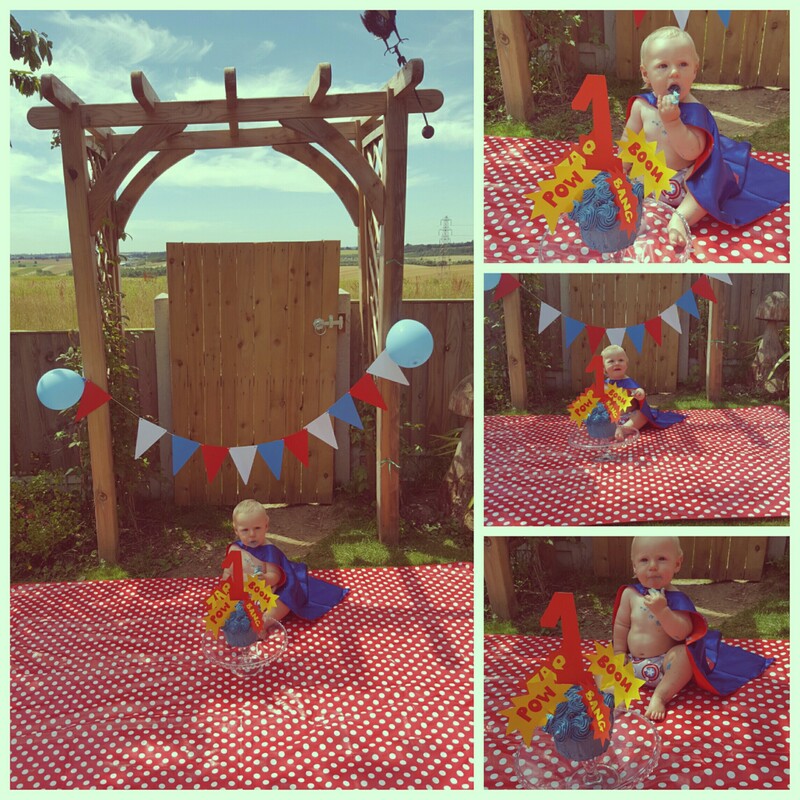 I put Alfie in his nappy and cape and then just let him go wild! 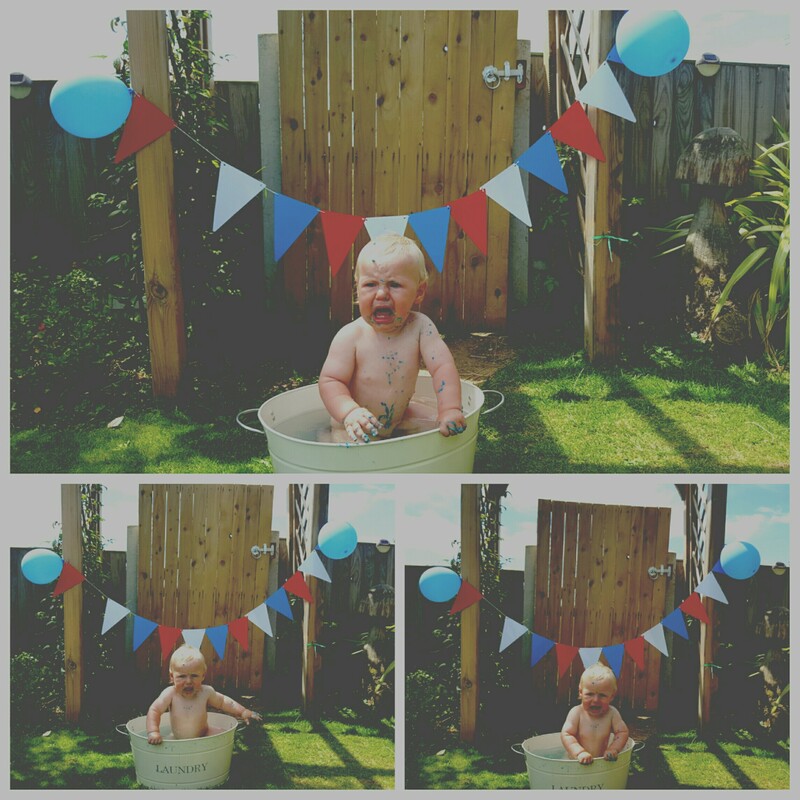 He wasn’t so keen on the bath afterwards which was a shame as I really wanted some cute bath pics with bubbles, but as my husband said, the photos captured the reality of what actually happened! We had a lovely day and I’m so glad we decided to do it ourselves, as we had the whole day to get the photos and so didn’t feel too pressured. It also meant we could do some and then go back to it. We used my parents garden, which was the perfect backdrop and the weather was beautiful so we were very lucky! 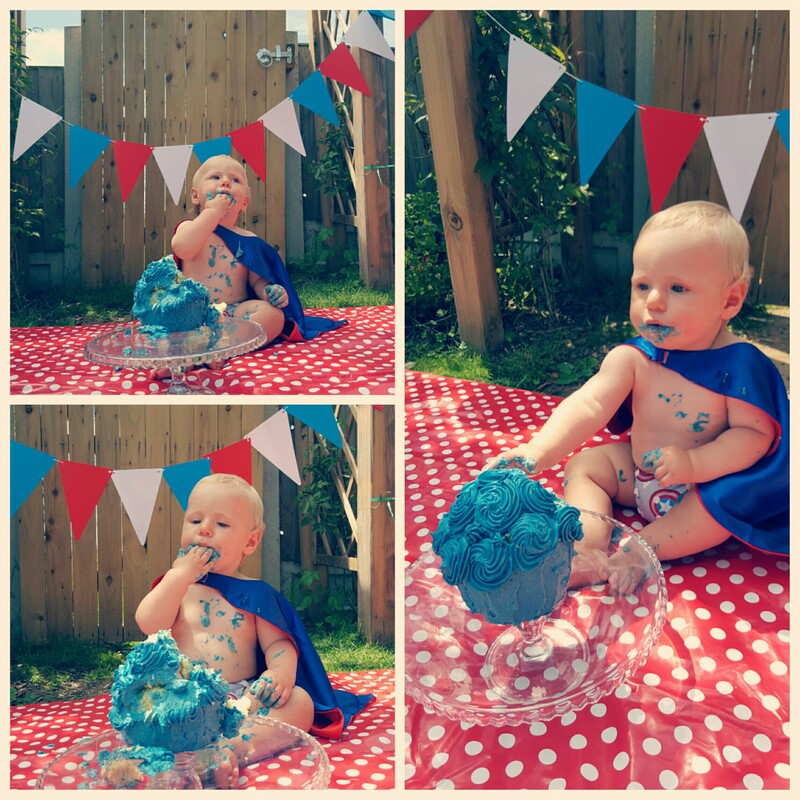 Anyone thinking of doing a cake smash, I’d highly recommend whether you DIY it or hire a professional, you’ll get some great photos. I’ll stop waffling now and let the pictures speak for themselves! 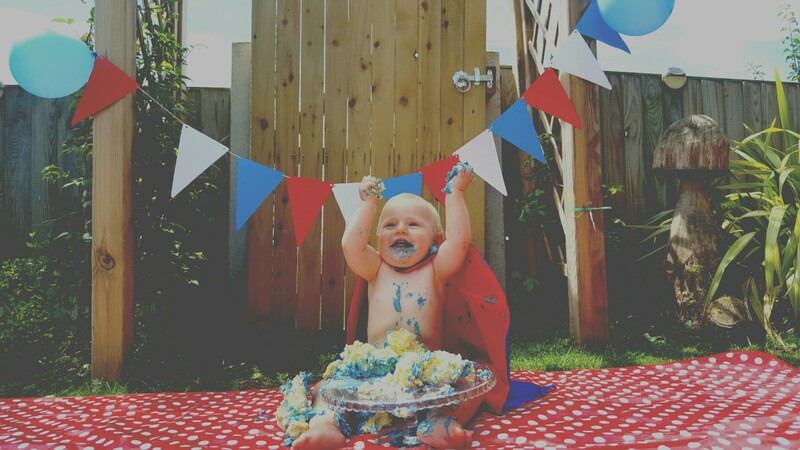 I think a cake smash is so fun! Your pictures are wonderful!! Great work 🙂 And happy birthday to your little superhero! 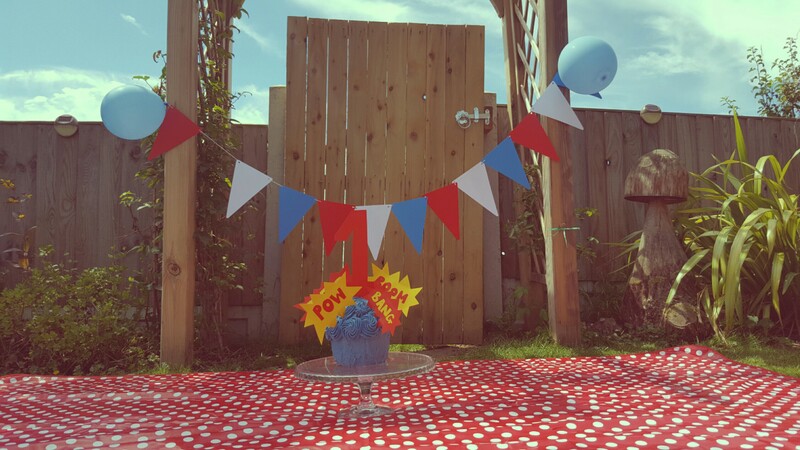 Can i do a cake smash for my 33rd birthday please?! How much fun does this look!! 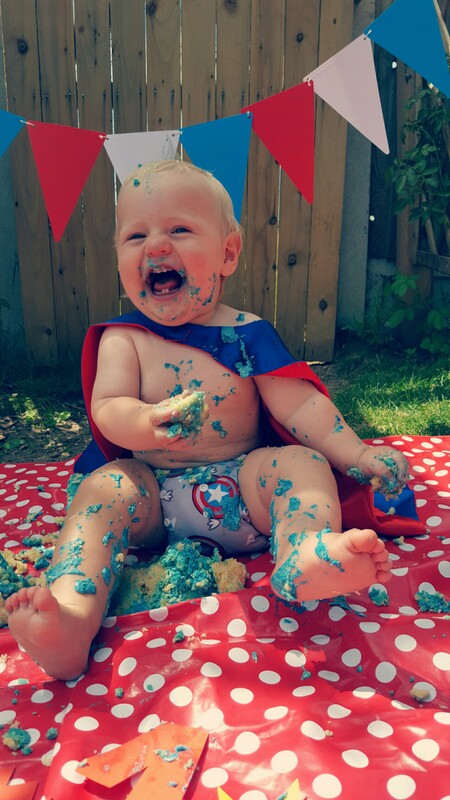 and you little boy is the cutest little thing sat there all superhero like: cat that got the cream / baby got the cake. I love these piccies! You got some great shots..I might just give this a go myself in October. Dangermouse would love it! 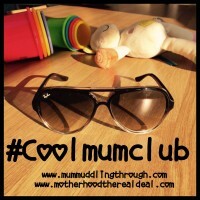 Definitely give it a go, it was so much fun and so easy to do. Alfie loved it! Ahhh what fab piccies and it looks so much fun! I couldn’t deal with the sticky mess haha. Thanks so much for linking up with the #bestandworst stop by again!